Brand New Battery! Not Refurbished. Life: A new LION has a shelf life of five (5) years stored at proper temperatures. Shelf life is defined as the length of time a battery can be stored, prior to installation into AED, without degrading its performance. Proper storage temperature is between 0°C to +50°C (32°F to +122°F). Recommended Replace Interval:Three (3) years, depending upon usage. Self Testing: With the lithium battery pack installed, the AED automatically tests it as part of the Daily Auto test. In addition, every 28 days a self test is performed to check the battery overload, electrodes, electronics, full energy charge cycle and software.Useful Life and Expected Capacity: When optimally maintained, a new lithium battery pack has a capacity of 7.5 Amp hours, which is equivalent to 12 hours of "ON" time. 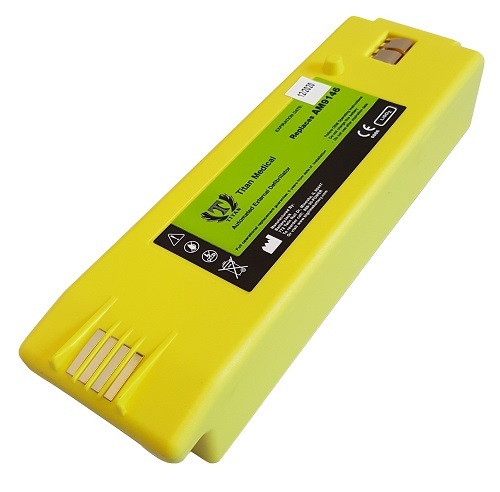 It is important to know that just turning the AED on uses up battery capacity. Also, each year, battery capacity decreases while the battery is in the AED due to the normal self-discharge rate. After 4 years of absolutely no patient use, approximately 35% of the useful life will remain (4.9 hours of "ON" time)Proper Maintenance: Do not attempt to recharge. Do not use beyond the expiration date marked on the label. Do not expose to temperatures greater than 50 degrees Celsius (122 F). Do not allow electrical connection between the contacts, as it can blow the internal fuse and disable the battery permanently.Ground Transport Only: Cannot be shipped by air (Priority Overnight, Standard Overnight, 2nd Day, 3rd Day, International) due to federal regulations regarding the transport of primary lithium cells on aircraft.